Sweet potatoes, not to be confused with yams, have been cultivated for thousands of years. These root vegetables are believed to have originated in Central and South America. North Carolina, which is now the largest producer of sweet potatoes in the United States, claims the sweet potato as their state vegetable. There are more than 400 varieties of sweet potatoes around the world! 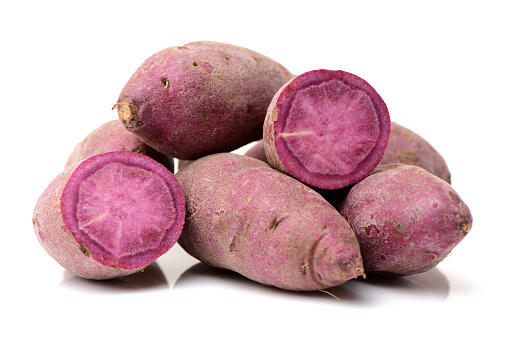 You are probably most familiar with the delicious, orange-fleshed sweet potato, but there is also a beautiful purple sweet potato that is worth trying. Don’t limit eating sweet potatoes to Thanksgiving season. They are available all year and pack a lot of health benefits. Let’s take a closer look at some of the health benefits of this vegetable. Sweet Potatoes May Help Fight Inflammation. Orange-fleshed sweet potatoes are a great source of beta-carotene, which the body converts to vitamin A, a powerful antioxidant that helps fight inflammation by diminishing free radical damage. If we can reduce our amount of free radical damage, we may also be able to lower our risk of life-threatening diseases, like cancer. 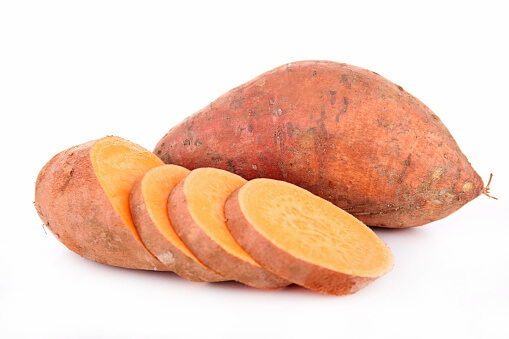 Orange-fleshed sweet potatoes have more than 400 percent of your daily vitamin A needs! Make sure to eat them with a little bit of good fat, like olive oil. The fat helps your body better absorb the vitamin A. Sweet Potatoes May Help Protect You From Dangerous Heavy Metals. Purple sweet potatoes may be able to lower the potential health risks posed by heavy metals and oxygen radicals. They are rich in compounds called anthocyanins, which provide a lot of antioxidant activity and may bind to heavy metals, like mercury, and help remove them from the body. Sweet Potatoes May Help with Liver Damage from Excessive Alcohol Consumption. Anthocyanins in purple sweet potatoes are also associated with improving liver damage from alcohol abuse, according to a study with mice conducted by the NIH. Sweet Potatoes May Help Regulate Your Blood Sugar. Sweet potatoes contain adiponectin, a protein made by fat cells that circulates in the bloodstream. Low levels of this protein have been found in people who have trouble metabolizing insulin. Sweet potatoes are also rich in fiber. Fiber helps pace digestion, which is good for regulating blood sugar levels. Calcium, 40 mg. Of course, calcium is important for building and maintaining strong bones and teeth. This mineral is also important for maintaining hair and nail health in perimenopausal and menopausal women. Adequate calcium intake may also decrease your risk for colorectal cancer. Magnesium, 33 mg. Magnesium helps with blood pressure regulation and also has antioxidant properties. Several studies have also shown an improvement in the severity of symptoms of depression when study participants were given 125-300 mg of magnesium with each meal and at bedtime. Phosphorus, 63 mg. This mineral works with calcium to build strong bones and teeth. It is also needed to help balance and use other vitamins and minerals, including vitamin D, iodine, magnesium and zinc. Potassium, 448 mg. This mineral works with sodium to balance the fluid and electrolytes in the body. Potassium also helps keep blood pressure under control and may help reduce kidney stones and bone loss as you age. It may even reduce your risk of stroke. Most adults need about 4,700 mg of potassium per day. So, sweet potatoes are a great place to start. Sodium, 73 mg. If you have high blood pressure, your doctor has probably told you to cut back on salty foods. Reducing your sodium intake can help lower high blood pressure. What your doctor may not have told you is that a good balance of sodium and potassium can also help to reduce blood pressure. Studies show that the sodium/potassium ratio intake should be less than 1. Unfortunately, only 12 percent of the U.S. population has this adequate ratio. The American Heart Association recommends a maximum daily intake of 1,500 mg of sodium, but in reality 99.8 percent of the population consumes much more. Avoid processed foods, which tend to have alarming amounts of sodium per serving. Sweet potatoes are a great source of natural sodium. Folate, 15 mcg. Folate (also called vitamin B9) is a very important nutrient, especially for pregnant women. Folate may help prevent cancer and heart disease and improve mental health. Choline, 16.4 mg. Choline is a nutrient that was recognized as an essential nutrient by the Institute of Medicine (IOM) in 1998. “The importance of choline in the diet extends into adulthood and old age. 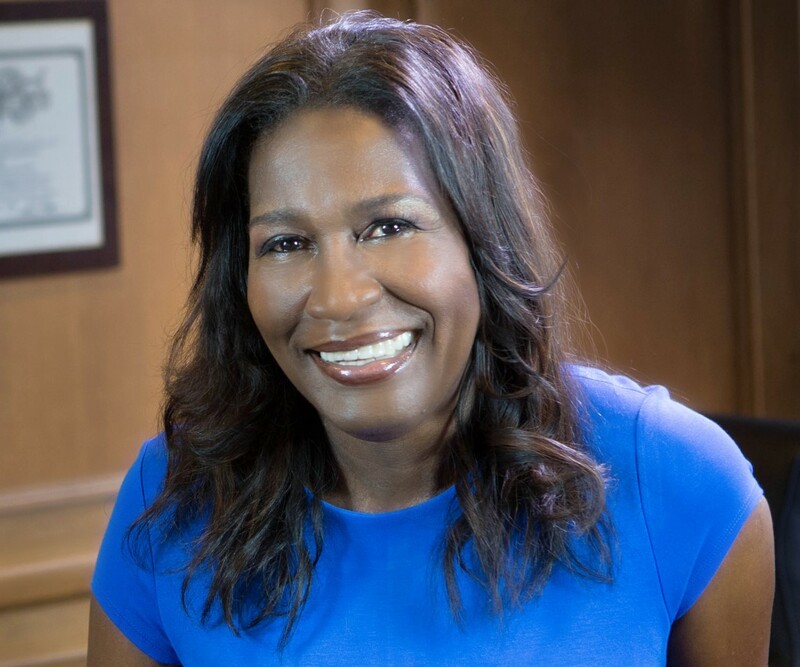 In a study of healthy adult subjects deprived of dietary choline, 77% of the men and 80% of the postmenopausal women developed signs of subclinical organ dysfunction (fatty liver or muscle damage),” reports the NIH. Oven-baked sweet potato fries make a great, healthy snack or side to go along with your dinner. If you are looking to be a bit more innovative with these root vegetables, search onliine for recipes for sweet potato brownies.